2 CORINTHIANS 3:18 KJV "But we all, with open face beholding as in a glass the glory of the Lord, are changed into the same image..."
15But even unto this day, when Moses is read, the vail is upon their heart. 16Nevertheless when it shall turn to the Lord, the vail shall be taken away. 17Now the Lord is that Spirit: and where the Spirit of the Lord is, there is liberty. 18But we all, with open face beholding as in a glass the glory of the Lord, are changed into the same image from glory to glory, even as by the Spirit of the Lord. 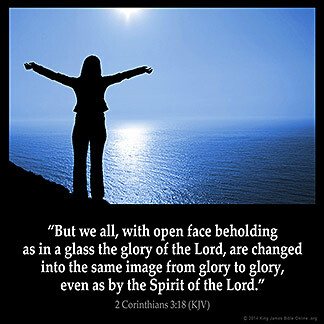 But we all, with open face beholding as in a glasse the glory of the Lord, are changed into the same image, from glorie to glorie, euen as by the spirit of the Lord. But *we* all, looking on the glory of the Lord, with unveiled face, are transformed according to the same image from glory to glory, even as by [the] Lord [the] Spirit. And all of us, with unveiled faces, reflecting like bright mirrors the glory of the Lord, are being transformed into the same likeness, from one degree of radiant holiness to another, even as derived from the Lord the Spirit. And alle we that with open face seen the glorie of the Lord, ben transformed in to the same ymage, fro clerenesse in to clerenesse, as of the spirit of the Lord. 3:18 And, accordingly, all we that believe in him, beholding as in a glass - In the mirror of the gospel. The glory of the Lord - His glorious love. Are transformed into the same image - Into the same love. From one degree of this glory to another, in a manner worthy of his almighty Spirit. What a beautiful contrast is here! Moses saw the glory of the Lord, and it rendered his face so bright, that he covered it with a veil; Israel not being able to bear the reflected light. We behold his glory in the glass of his word, and our faces shine too; yet we veil them not, but diffuse the lustre which is continually increasing, as we fix the eye of our mind more and more steadfastly on his glory displayed in the gospel. 2Co 3:18 But we all. All Christians. With open face beholding as in a mirror the glory of the Lord. Looking to Jesus and beholding in his covenant, in our hearts and minds as in a mirror, and contemplating his glory. Are changed into the same image. To look to Jesus has a transforming power. If we gaze upon him, we will become like him. As Moses unveiled before the Lord shone with the glory of the Lord, so we shall reflect the glory of Christ, and show forth his likeness. From glory to glory. Developing from one stage of glory to a higher one. [Even as by the Spirit of the Lord. Rather, "The Lord the Spirit", as in the Revised Version. 2Co 3:17 declares "the Lord is that Spirit". Our glory is from the Lord the Spirit. The figure here is a very beautiful one. By gazing upon the Lord we become like him and show forth his glory. When Moses went up the mount ,the glory of the Lord was within and on his face. he put a veil over his face to conceal the fading of the Glory of God from the children of Israel. Now the Glory of God is not fading away. Through Jesus Christ. We as children of God always have a Glow within and on us always. Praise God for His amazing Grace . The more we submit to the Holy Ghost and allow Him to work through us, the more like Christ we become. His brightness shines throuh us lightening our countenance bringing true the verse that says in Matt 5 14 "Ye are the light of the world. A city that is set on a hill, cannot be hid. " The more we spent time reading His and the more we fast and pray our lives are then changed into the same image. Correction "aglow with the indwelling Christ"
The more that we commune with Jesus and come into his presence more of the veil will fall off we will be able to see more clear. Then more of his glory will abide within us, and then be reflected through us. His glory will be seen upon us.